Found in city parks, memorial parks and countless other public places, memorial and commemorative benches dedicated by friends and family remind us of past events and loved ones in our lives. When it comes to your glass fiber reinforced concrete (GFRC) memorial or commemorative bench, Stromberg offers you professionalism with a personal touch; with their 30 years of experience, you can expect the highest quality. 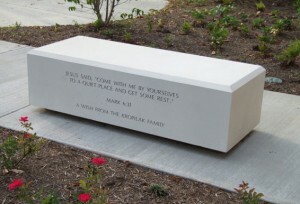 Stromberg will engrave your bench in the script of your choice to honor your loved ones or remember a special occasion. Stromberg Architectural Products manufactures superb architectural products the world over, and they offer a comprehensive line of materials, including the popular GFRC. Glass fiber reinforced concrete benches are available in a variety of colors, textures, finishes and styles. You might consider placing your bench in a park, along a nature trail, at your community center or near the gravesite of a loved one. Whatever location you choose, be assured that the experts at Stromberg will go above and beyond the call of duty in producing a bench you and your family can be proud of. A bench from the experts at Stromberg is an excellent way to remember your loved one, or event. GFRC benches by Stromberg can be placed in the entryway of a hotel lobby, courthouse or restaurant waiting area. An indoor commemorative bench can help make your guests feel welcome while reminding them of a past event. Because Stromberg uses molds, your bench can be crafted in almost any shape or design you choose; you’ll be well-served by the choice of custom designs available. You can choose a bench customized to your preferences and needs. Glass fiber reinforced concrete is lightweight yet strong enough to stand up to heavy use. GFRC can be made to look like natural stone, or simply painted. Glass fiber reinforced concrete is an earth-friendly product. The artisans at Stromberg Architectural Products will work closely with you to make sure your GFRC commemorative or memorial bench is exactly as you envision; they take pride in their work and it shows. Stromberg is here to help with CAD details, design assistance and specifications. Contact them today at (903) 454-0904 for a free custom quote, and put their 30 years of experience to work for you.